I'm djing. There will be dresses and pop music and drinking and maybe some dancing. A good time will be had by most (good time not guaranteed). I will play "Then He Kissed Me" by the Crystals (guaranteed). Come out! Immensely lazy about posting, in the second day of a lovely headache, wearing an elastic-waisted skirt that's a little bit too stretched with binder clips holding it up, drinking coffee, tan (for a very Irish-looking white girl), alternating between flashing my bra and tugging up my shirt, dreading going to dinner at my parents' tonight because my mom will surely point out the aforementioned visible bra. Yeah. I'm having a fashion plate day today. I got dressed forgetting that the skirt needed to be shrunk or taken in or something, so I avoid showing my underwear to the world - luckily I am not wearing a thong, but rather solid cotton underwear. I also got dressed wearing another shirt and then dropped the strawberry I was eating right before heading out. I treated the stain immediately, so it should be fine. I didn't check to make sure my bra worked with the new shirt I grabbed. I'm betting Mom will mention it within two minutes of us alone (no Dad or brother in the room). The over/under is one. While my family shows restraint in some things, Christmas is not one of them (although I still haven't convinced my dad to invest in an inflatable snow globe with carousel). 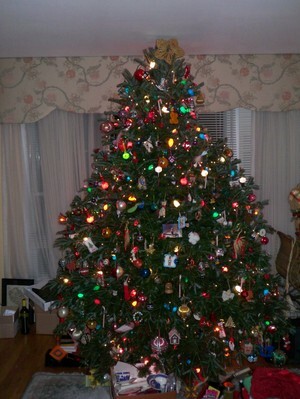 The family tree is an exercise in excess, but it's tradition and we wouldn't be happy without it. There are four kinds of lights because that's how we do things. 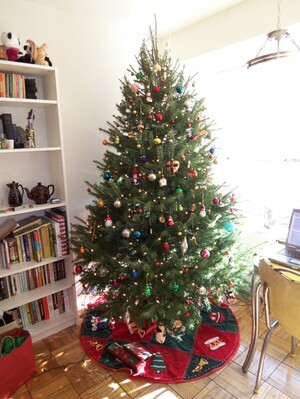 This year, Jenny and I speculate that a box or two of ornaments went missing because the tree looks a little bare. Mine is still quite empty, but I'm young yet. Since the death of Reagan, the idea of a president passing has taken on a whole new meaning in DC. Federal holiday, and I freely admit that when I saw a headline announcing the death of Gerald Ford, my first thought was "four-day weekend!". Now I have nothing against Ford; I just happen not to know much about him. I was only alive for four months of Ford's presidency, so I don't remember anything of that. In school, history classes never made it far past World War II and once I had the choice, I preferred to study European history. Prior to the massive news coverage, I may have learned everything I know about Ford from that Simpsons episode. Apparently someone else doesn't find him that important either because there is no federal holiday. *edited on Friday, December 29th. Gerald Ford, I take it all back. You were truly a great man. Between your day of mourning and my planned absence today, I'll have a five day weekend. Yahtzee! I made out very well at Christmas. Still no pony, but I'm sure that one of these years Santa will come through. I got my camera and will post tree pictures tomorrow. For now, I have the truly important pictures of Andi, the family dog. He's 18. I'm not really sure what the face is in that last picture, but he's normally loads cuter than that. Today I'm doing a bit of a mad dash to finish my shopping. Normally I would have finished last weekend, but I was working all weekend. So I'm just going to post a pictures of a few of my favorite ornaments. They're all the sort that clip onto the branch and sit above it. Two are the traditional birds. The third is not. Totally not a bird. My favorite thing about him is that he was purchased in France. Apparently the French have a good sense of humor. Normally, I'm a very law-abiding person, not that I have many opportunities to break the law, but I generally choose not to. I don't jaywalk and I usually don't eat or drink on the metro. This morning I had to run by the post office on the way to work and Starbucks is right next door and this late in the holiday season I still hadn't had a peppermint mocha. The lure was inescapable. As I approached the gate and was getting out my SmarTrip card, i managed to splash some coffee on my hand. I felt damned stupid and yet quite thankful that my jacket and shirt were black. I made it to the train without incident and reminded myself to secure the SmarTrip before exiting the train on the other end to avoid a repeat. Then while taking my first surreptitious sip on the train, it jolted and I spilled coffee down my shirt, which, again thankfully, was black. I like to think that this was the universe's way of telling me to keep staying in those crosswalks and stopping when the little walking man flashes red. I will listen. Today I am wearing knee socks because that and white gym socks are the only things I have clean. Where's the goddamned laundry fairy when you need her? And why do I only run out of socks? Unfortunately, I cannot ask for socks for Christmas. See there was this incident when my brother was six or seven. My dad was helping him buy presents for my sister and me. We got socks. Someone might have been mocked mercilessly. It might have been both my brother and my dad. So, socks at Christmas are a bit of a joke in my family. And I cannot reasonably ask for socks without justifying the earlier sock debacle. And I'm going to have to buy my own damned socks, which I'm totally okay with. pop tunes of all kinds. seriously, though. all kinds of pop tunes that we actually like. I don't have my playlist from last time, but I have my July playlist. Come out. There will be beer. And girls in dresses.